New ways to visually enhance your profile: We want your LinkedIn profile to reflect your unique brand. To enable a more personal feel, we’ve incorporated several new visual updates to help you stand out, including a larger photo and expanded profile header, early access to a new custom profile background, and an exclusive gallery of beautiful background images should you need a little inspiration. In a few months, all members will be able to add a custom profile background. To request to be one of the first to take it for a spin, click here. 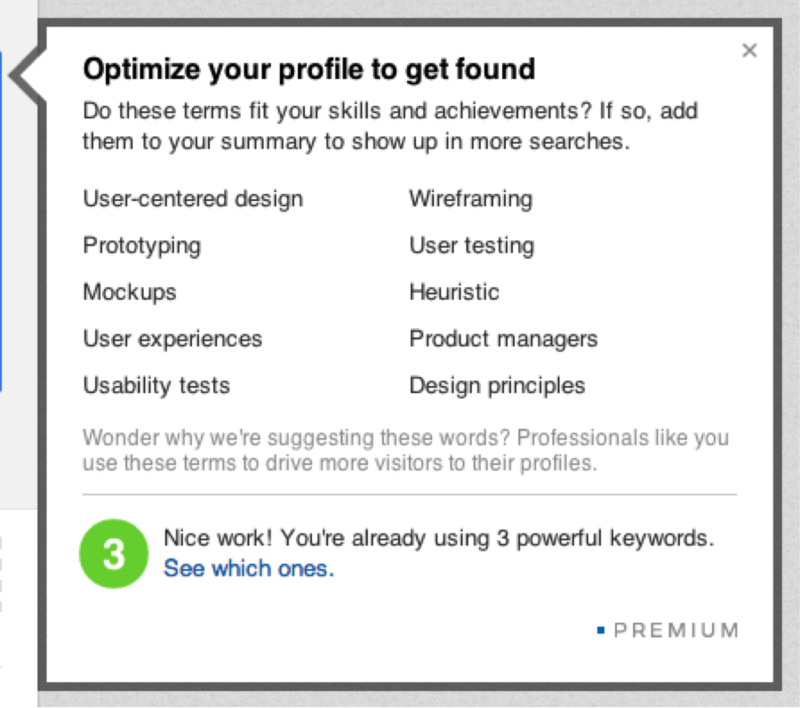 Suggestions to help you optimize your profile: We know it can be a daunting task when you don’t know what to put on your profile. We wanted to make this process easier by prompting you with top keyword suggestions to help with writer’s block. These personalized suggestions are also optimized to help you get found in search. The profile summary is a great way to showcase who you are professionally and what you care about. What you say will have a very meaningful impact on the kinds of people and opportunities you attract. Standing out in search results: With millions of professionals on LinkedIn, a little competitive edge can go a long way. The next time someone searches for, let’s say a “designer” on LinkedIn, your profile will look twice as big as other results and offer more tidbits from your profile to help people easily spot you. Opening yourself to incoming opportunities with Open Profile: We want to help you be found for opportunities far and wide. In order to tap into important connections outside of your network, you will have the option to make your profile “open” so that every LinkedIn member can see your full profile and reach out to you for free. Tracking your impact and visibility: We know you like seeing who’s checking you out. Being able to see a full 90-day list of Who’s Viewed Your Profile can be an invaluable tool to help you manage your network and generate new business relationships. You will also be able to access the top 100 results for How You Rank against your first-degree connections and company. This can be a great way to see how your LinkedIn presence measures up against your peers. As part of this roll out of new features to our premium experience, we are also introducing a new starter package called Premium Spotlight. This new subscription consists of all the features mentioned above and is designed for ambitious professionals who are looking to take their career to the next level. Are you ready for that big promotion? Check out our Linkedin Premium offerings here. We are continuously looking at new ways to add more value to our premium experience and this is just the first step of many this year. We look forward to hearing your feedback and giving you more reasons to take advantage of what our premium experience has to offer.